Multidrug resistant infections and superinfections are increasing globally. Intrinsic and acquired resistance to multiple antibiotics by bacteria from the Enterobacteriaceae family exasperate treatment efforts by clinicians. 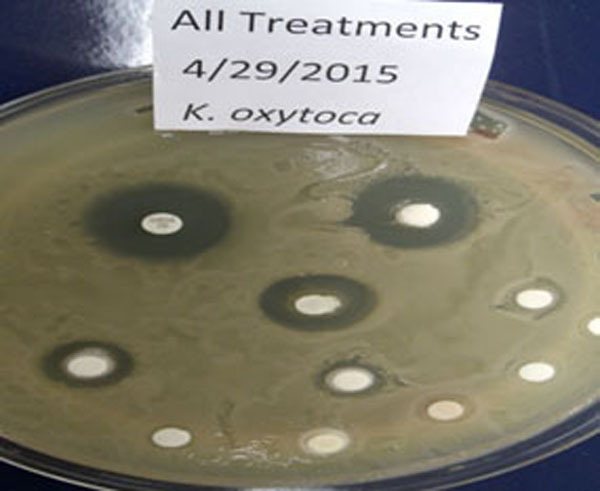 Carbapenem antibiotics were once relied upon to treat multidrug resistant infections. However, Carbapenem Resistant Enterobacteriaceae (CRE) infections are becoming more common, requiring that an alternative treatment be found. This study trialed an ancient cure, Fresh Garlic Extract (FGE) created from garlic (Allium sativum L.) and commercially prepared garlic pills against two opportunistic Enterobacteriaceae in vitro utilizing: disc diffusion, well diffusion (introducing DIFF-bolts), and HPLC. FGE and four brands of garlic pills inhibited the growth of Enterobacter cloacae and Klebsiella oxytoca in vitro. General Nutrition Center (GNC) brand were found to be the most effective garlic pills producing comparable clear zones to meropenem (carbapenem antibiotic) for both bacteria. Garlicin produced the next largest clear zones followed by Garlique and Nature made. Five out of nine garlic pill brands tested were not found to contain viable allicin failing to produce clear zones in all microbial tests. Keywords: Allicin, disc diffusion, DIFF-bolts, Enterobacter cloacae, garlic, garlic pills, Klebsiella oxytoca, well diffusion. © Choules et al. ; Licensee Bentham Open. Multidrug resistant infections and super infections affected over two million Americans last year [1CDC. Antibiotic Resistance Threats in the United States, 2013. Available from: http://www.cdc.gov /drugresistance/threat-report-2013/]. Carbapenem Resistant Enterobacteriaceae (CRE) is of particular concern as few other treatments are available to patients [2Kanj, S.S.; Kanafani, Z.A. Current concepts in antimicrobial therapy against resistant gram-negative organisms: extended-spectrum β-lactamase-producing Enterobacteriaceae, carbapenem-resistant Enterobacteriaceae, and multidrug-resistant Pseudomonas aeruginosa. Mayo Clin. Proc., 2011, 86(3), 250-259. [http://dx.doi.org/10.4065/mcp.2010.0674] [PMID: 21364117] ]. Recently in the news, multiple cases of CRE have been reported in hospitals across the country resulting in several deaths [3Eisler, P. Deadly bacteria on medical scopes trigger infections. PhD Dissertation; Lawrence F Muscarella: USA Today, 2015. ]. The CDC has classified CRE at a threat level of “urgent” as a high fatality rate (about half of all infected patients) is associated with these infections [4CDC. Carbapenem - resistant Enterobacteriaceae Healthcare settings, 2015. Available from: http://www.cdc.gov/HAI/organisms/cre/]. Enterobacter cloacae and Klebsiella oxytoca are opportunistic members of the Enterobacteriaceae family [5International Life Scienes Institute (ILSI). The Enterobacteriaceae and their significance to the food industry. ILSI Europe Report Series Commissioned by the ILSI Europe Emerging Microbiological Issues Task Force, 2011. Available from: http://www.ilsi.org /Europe/Pages/ReportSeries.aspx?ppPublications=7&CSFPublications=PubType&SOPublications=ASC]. Both are facultatively anaerobic, gram-negative rods which are normal intestinal flora of humans and generally non-pathogenic to their host [6Paauw, A.; Caspers, M.P. ; Schuren, F.H. ; Leverstein-van Hall, M.A. ; Delétoile, A.; Montijn, R.C. ; Verhoef, J.; Fluit, A.C. Genomic diversity within the Enterobacter cloacae complex. PLoS One, 2008, 3(8), e3018-e3018. [http://dx.doi.org/10.1371/journal.pone.0003018] [PMID: 18716657] ]. However, once released from their host in a nosocomial setting they may become pathogenic infecting immunocompromised individuals via biofilms on medical equipment or other fomites [6Paauw, A.; Caspers, M.P. ; Schuren, F.H. ; Leverstein-van Hall, M.A. ; Delétoile, A.; Montijn, R.C. ; Verhoef, J.; Fluit, A.C. Genomic diversity within the Enterobacter cloacae complex. PLoS One, 2008, 3(8), e3018-e3018. [http://dx.doi.org/10.1371/journal.pone.0003018] [PMID: 18716657] , 7Kim, S.M. ; Lee, H.W. ; Choi, Y.W. ; Kim, S.H. ; Lee, J.C.; Lee, Y.C. ; Seol, S.Y. ; Cho, D.T. ; Kim, J. Involvement of curli fimbriae in the biofilm formation of Enterobacter cloacae. J. Microbiol., 2012, 50(1), 175-178. Enterobacteriaceae bacteria possess intrinsic (innate) resistance to beta lactam antibiotics and can acquire resistance to multiple other types of antibiotics from enzymes called “extended spectrum beta lactamase (ESBLs)” transferred via plasmid from other bacteria [8Rupp, M.E. ; Fey, P.D. Extended spectrum β-lactamase (ESBL)-producing Enterobacteriaceae: considerations for diagnosis, prevention and drug treatment. Drugs, 2003, 63(4), 353-365. [http://dx.doi.org/10.2165/00003495-200363040-00002] [PMID: 12558458] -10Liu, H.; Wang, Y.; Wang, G.; Xing, Q.; Shao, L.; Dong, X.; Sai, L.; Liu, Y. The prevalence of Escherichia coli strains with extended spectrum beta-lactamases isolated in China. Front. Microbiol., 2015, 6, 335. Carbapenem antibiotics such as imipenem and meropenem are broad spectrum antibiotics capable of inhibiting beta lactamase producing bacteria; allowing them to treat infections when other antibiotics had failed; earning them the name “the antibiotic of last resort” [4CDC. Carbapenem - resistant Enterobacteriaceae Healthcare settings, 2015. 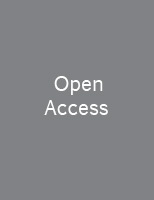 Available from: http://www.cdc.gov/HAI/organisms/cre/, 11Walsh, F. Doripenem: A new carbapenem antibiotic a review of comparative antimicrobial and bactericidal activities. Ther. Clin. Risk Manag., 2007, 3(5), 789-794. [PMID: 18473003] , 12Papp-Wallace, K.M. ; Endimiani, A.; Taracila, M.A. ; Bonomo, R.A. Carbapenems: past, present, and future. Antimicrob. Agents Chemother., 2011, 55(11), 4943-4960. [http://dx.doi.org/10.1128/AAC.00296-11] [PMID: 21859938] ]. However, this group of antibiotics are also subject to resistance and CRE infections began to emerge more than a decade ago leaving many patients today without a viable cure [12Papp-Wallace, K.M. ; Endimiani, A.; Taracila, M.A. ; Bonomo, R.A. Carbapenems: past, present, and future. Antimicrob. Agents Chemother., 2011, 55(11), 4943-4960. Garlic (Allium sativum L.) is a bulbous herb from the family Liliaceae which is often used as a food flavor enhancer or topping [13Salami, H.A. ; John, A.I. ; Ekanem, A.U. The effect of aqueous preparation of Allium cepa (onion) and Allium sativa (garlic) on erythrocyte osmotic fragility in Wistar rats: in vivo and in vitro studies. Niger. J. Physiol. Sci., 2012, 27(1), 29-34. [PMID: 23235305] ]. This herb is thought to possess potent antimicrobial properties and therefore has been utilized as a medicine for centuries [14Harris, J.C.; Cottrell, S.L. ; Plummer, S.; Lloyd, D. Antimicrobial properties of Allium sativum (garlic). Appl. Microbiol. Biotechnol., 2001, 57(3), 282-286. [http://dx.doi.org/10.1007/s002530100722] [PMID: 11759674] ]. Most of the anti-microbial properties of garlic are attributed to a component called “allicin” (allyl 2- propenethiosulfinate) [15Ross, Z.M. ; O’Gara, E.A. ; Hill, D.J. ; Sleightholme, H.V. ; Maslin, D.J. Antimicrobial properties of garlic oil against human enteric bacteria: evaluation of methodologies and comparisons with garlic oil sulfides and garlic powder. Appl. Environ. Microbiol., 2001, 67(1), 475-480. [http://dx.doi.org/10.1128/AEM.67.1.475-480.2001] [PMID: 11133485] ]. Allicin has fewer side effects than traditional antibiotics, there is less chance of resistance, and it is inexpensive to create. 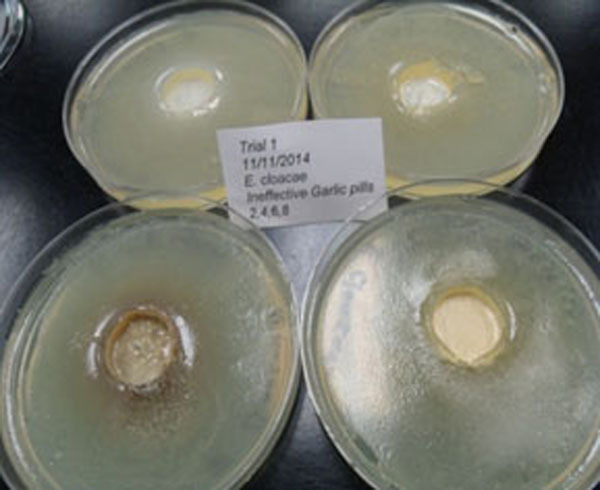 The aim of this study was to determine via disc and well diffusion microbiological testing (compared to HPLC), whether fresh garlic extract (FGE) or commercially prepared garlic pills inhibited the growth in vitro of either Enterobacter cloacae or Klebsiella oxytoca. Rehydrated cultures of E. cloacae (ATCC) 23355 and K. oxytoca (ATCC) 8724 obtained from Hardy Diagnostics in Santa Maria, CA, USA. were utilized for the bacterial cultures. A loop-full of each pure culture was added to glass bottles of sterile nutrient broth and then grown for 24 h at 37 oC. Turbidity was adjusted with a BioTek µQuant Spectro-photometer - 90 mL bacterial culture to 600 mL nutrient broth for E. cloacae and 100 mL bacterial culture to 100 mL nutrient broth for K. oxytoca. Inoculum was added to plates via pipette, 125 µL for standard plates and 400 µL for large plates. Mueller Hinton Agar base for antimicrobial disc diffusion susceptibility testing, 500 g, Lot 142697. 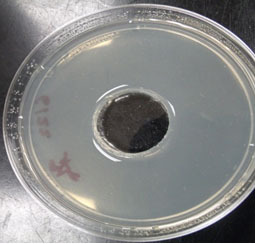 Cultures for spread plates were grown overnight in Difco Nutrient broth- Lot 7239160. 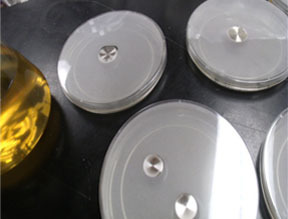 Microbial Plates Standard size petri dishes (100 × 15 mm) from VWR International were utilized for disc and well diffusion- as well as larger 150 × 15 mm disposable polystyrene petri dishes from USA Scientific, Ocala, FL, USA. Standard procedure for the Kirby-Bauer Disc Diffusion Method was followed [16Bauer, A.W. ; Kirby, W.M. ; Sherris, J.C.; Turck, M. Antibiotic susceptibility testing by a standardized single disk method. Am. J. Clin. Pathol., 1966, 45(4), 493-496. [PMID: 5325707] ]. Diffusion discs - 6 mm blank paper diffusion discs - from Becton, Dickinson and Company (BDL), Sparks, MD 21152, USA. Lot 4034351 exp. 2019-02-28. Blank discs were soaked in treatments (dissolved garlic pills or FGE) for two minutes. 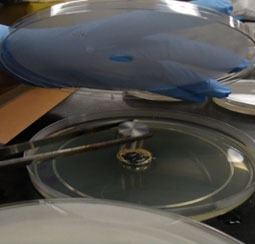 Diffusion discs were then applied to the plates with sterile autoclaved forceps. Multiple treatments were placed on the same large 150 × 15 mm plate for comparison purposes including a meropenem positive control and a water negative control. Spread plates were inverted and incubated for 30 min prior to the addition of treatment discs. Note plates were not inverted overnight. In 1997, Sylvia Magaldi a Venezuelan researcher, developed the well diffusion (WD) technique which utilizes agar wells instead of paper discs [17Magaldi, S.; Mata-Essayag, S.; Hartung de Capriles, C.; Perez, C.; Colella, M.T. ; Olaizola, C.; Ontiveros, Y. Well diffusion for antifungal susceptibility testing. Int. J. Infect. Dis., 2004, 8(1), 39-45. [http://dx.doi.org/10.1016/j.ijid.2003.03.002] [PMID: 14690779] ]. Well diffusion (aka cup plate) allows researchers to test much larger doses and therefore has the potential to create much larger clear zones. Other trials have utilized cork borers and like equipment to produce wells. We noted that these methods left the plate open long enough to possibly allow contaminants to enter the plates. 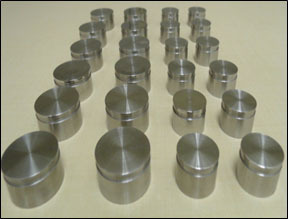 Thus, we developed stainless steel diffusion bolts (DIFF-bolts) that fit inside the plate allowing the plate to remain closed for most of the process (Fig. 1 ). These bolts produced a much larger well than past methods, which in turn created very large clear zones (Table 1). Stainless steel was used to create the DIFF-bolts because it is not as reactive as other metals and is easy to clean. 2.54 cm DIFF-bolts were utilized for most of the study as the 1.91 cm were too light and at times would float out of position causing odd looking wells. DIFF-bolts two sizes were trialed 2.54 cm and 1.91 cm. The SFASU DIFF-bolt development team included: Lucinda Choules, Dr. Dennis A. Gravatt, Clay Watts and Ron Havner. Autoclaved diffusion bolt/s were placed in the center of the plate with sterile forceps and agar was poured around the bolt (Fig. 2 ) (note: when using large plates more than one DIFF-bolt can be utilized on the same plate), the lid closed, and the plate monitored closely from the outside for a change in opacity. When this change was evident and the agarappearedsolid, the DIFF-bolt wasremoved withsterileautoclaved forcepsleaving aroundwell (Figs. 3 , 4 ). DIFF-bolts are placed in the center of the plate and agar poured around the bolts (Note: the agar solidifies with the plate closed. Thus, it will reduce possible contaminant issues). Photo of Lucinda Choules removing a DIFF-bolt by Ravaen Slay. When the agar solidifies the diffusion bolt is removed leaving a round well behind (Note: the wells are not always as clear as the well pictured above as bits of agar are often left behind on the bottom of the well). Removing the bolt too early may result in the well filling back in. Conversely, waiting too long to remove the bolt is also problematic as the bolt may adhere to the agar making it difficult to remove. Designing specialized forceps or modifying existing forceps to help with DIFF-bolt removal would be advantageous. Then, inoculum was spread over the agar, the specified treatment added to the well via disposable glass Pasteur pipette and the plates incubated (not inverted) at 37 oC for 24 h.
A future modification to the DIFF-bolt design may be required in order to produce wells without bits of agar at the bottom. For example, using a pipe instead of a rod may release the vacuum created by removing the bolt. However, if the pipe is too light it could float out of position before the agar hardens. This problem may be solved by drilling a hole through the center of a regular DIFF-bolt. This study utilized Spiceworld brand, Orlando, FL fresh garlic purchased from Wal-Mart. FGE was created in 50 mL sterile test tubes and allowed to develop between 2 and 4 h depending on the study. Three random bulbs were utilized for each trial. The Spiceworld bulbs varied greatly in size and weight, from 22-37 g, bulbs utilized for this study weighed approximately 27-32 g. Two cloves from each bulb were crushed in an autoclaved garlic press (total of six cloves). Each 50 ml test tube was filled with 30 mL of autoclaved Gerber water (purified via reverse osmosis) and then the cloves were crushed with an autoclaved garlic press into each test tube. The very outer white covering of each clove of garlic was removed, but parts of subsequent beige outer layers were added to the test tubes. Water was added to fill the tube to the 48-50 mL mark. Weight of garlic tubes averaged 61-65 g (including weight of tube). Depending upon how much water and peel was added. 50 mL tubes were then closed with the lid and left at room temperature for 2-4 h to facilitate allicin production. The Disc diffusion trials utilized meropenem discs - Sensi Disc Susceptibility test 10 µg lot 4210973 exp. 02/29/2016 from Becton, Dickinson and Company, Sparks, MD, USA. 25 mg Meropenem Sodium Carbonate powder from LKT laboratories Lot 2597783 obtained from Fischer Scientific was rehydrated by adding 2 mL autoclaved Gerber water to the vial provided by LKT containing the antibiotic powder. Then the vial was capped and shaken until the antibiotic dissolved. 100 µL of hydrated meropenem was added via pipette to 3 mL of autoclaved Gerber water. All treatments were inoculated into the agar wells via disposable heavy wall glass 5¾ Pasteur pipets from VWR Scientific, San Francisco, CA, USA. 10 mL of autoclaved Gerber water was added to the 15 mL test tube initially- 3 pills of each brand were crushed with a sterile mortar and pestle and then added to a the 15 ml plastic test tube. Weight of pills for each lot of 3 pills are as follows: GNC 5.52 g, Garlicin Cardio 1.99 g, Garlique 2.09 g, Nature Made 1.87 g. Since number of pills rather than weight were evaluated in this study, the results for some of the viable garlic pills such as Garlicin may be underreported as Garlicin produced large clear zones for its size and thus if equal weights of pills were trialed may produce comparable or superior results to GNC. However, weight is clearly not the only factor as Garlicin was lighter than Garlique but produced much larger clear zones. Future studies should investigate equal weights of pills in order to see if the rank changes. Additional Gerber water was added to fill each tube to the 15 mL mark. All tubes were then sealed with the lid and shaken, manually or by machine until the pills dissolved. When the pills were completely dissolved they were added to the wells with a Pasteur pipette. Additional pills were purchased when needed. The new pills produced similar results to the originals. Each garlic pill was assigned a number randomly prior to the initiation of the study. Nine brands of garlic pills were evaluated in this study: Ten pills were tested (Table 2). Effective garlic pills by randomly assigned experimental number. All 9 garlic pill brands and FGE were tested for presence or absence of allicin peaks via HPLC. Diluted garlic pills were filtered into Target polypropylene 45 µM vials and 1000 µL of each treatment was run through the filter into each vial until the sample vials were half full. 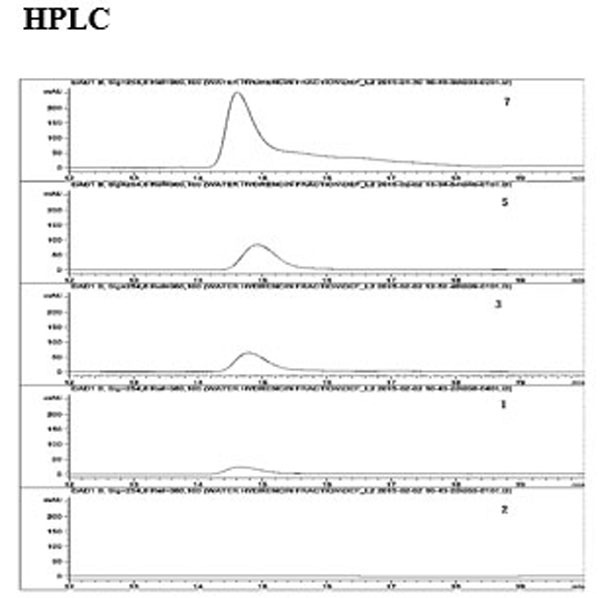 The samples were then subjected to HPLC analysis- Agilent 1260 HPLC system, Eclipse 5 μm XDB-C18 column, 0.6 mL/min, 22% acetonitrile in water, 254 nm [18Fujisawa, H.; Suma, K.; Origuchi, K.; Kumagai, H.; Seki, T.; Ariga, T. Biological and chemical stability of garlic-derived allicin. J. Agric. Food Chem., 2008, 56(11), 4229-4235. GNC 1000 exhibited a high pH similar to water, while the pH of the other effective pills was much lower, closer to that of fresh garlic extract (Table 3). Average pH of the solutions for effective treatments. Meropenem produced the largest clear zones (Figs. 5 , 6 ). But GNC produced statistically similar sized clear zones to meropenem and larger clear zones than FGE in disc diffusion trials (Fig. 7 , Table 4). Garlicin was the second most effective garlic pill followed by Garlique and Nature made which produced similar sized clear zones. Disc diffusion of different garlic products (S.D. : standard deviation. shows disc diffusion on large K. oxytoca plate for all treatments. Top left is meropenem, top right is GNC 1000 (Note: they produced very similar sized clear zones). Middle is FGE, next line Garlicin (left), Garlique (middle) and Nature Made (right). None of the pills on the bottom row produced a clear zone). In the graph above the average clear zones for all samples are compared. GNC 1000 produced similar sized clear zones to meropenem for both bacteria. In the bar graph above, Fresh garlic (FGE) in a larger dose produced clear zones that were slightly larger than meropenem this is not the case for the very fastidious E. cloacae plates where FGE ranked only fourth. GNC 1100 produced larger clear zones than GNC 1000 for both bacteria (Note: GNC 1100 produced statistically similar sized clear zones to that of meropenem). 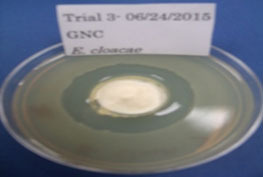 GNC 1100 was trialed in the larger dose well diffusion trials and was found to produce slightly larger clear zones than GNC 1000 which rivaled the clear zones produced by meropenem at times on the K. oxytoca plates (Fig. 8 , Table 5). Well diffusion of different garlic products (S.D. : standard deviation). 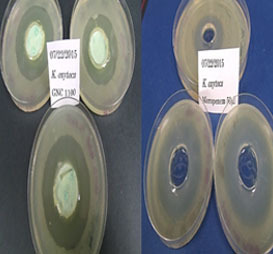 GNC 1100 results on standard sized plates (left) compared to meropenem (right) (Note: the similar sized clear zones produced on the K. oxytoca plates). E. cloacae grew many times faster than K. oxytoca. Thus, all of the treatments produced smaller clear zones on the E. cloacae plates. However, the zones while smaller were more consistently uniform in shape and very clear as is illustrated above in Fig. (9 ). The statistical analyses were created with SAS JMP software (SAS, 2015). The p values were found to be < .0001 for both disc and well diffusion. Thus, statistically significant differences were found between the treatments. Tukey tests showed that meropenem and GNC were statistically similar for both disc and well diffusion testing on E. cloacae plates and well diffusion K. oxytoca plates. However, a statistical difference was noted for disc diffusion trials on K. oxytoca plates. GNC 1000 clear zone on E. cloacae plate. The HPLC chromatograph below Fig. (11 ) Depicts the allicin peaks for each of the effective garlic pills. These results show an identical ranking to the microbial studies. GNC produced the largest peak, with the size of the wave decreasing for each subsequent effective pill. Later, HPLC analysis showed smaller peaks for Nature made and Garlicin as they degraded over time. No allicin peaks were visible for the five ineffective pills which is illustrated in the last line of the chromatograph above for garlic pill 2. Four of the five ineffective garlic pills tested are pictured above on E. cloacae-no clear zones were noted for these pills despite allicin claims on the packaging of all but one of these brands. HPLC chromatograph of garlic pills. First line of graph is garlic pill 7 (GNC 1000): 2nd line Garlic pill 5 (Garlicin), third line Garlic pill 3 (Garlique), fourth line garlic pill 1 (Nature Made) last line ineffective Garlic pill 2. The results of this study clearly show that E. cloacae and K. oxytoca were highly susceptible to allicin in vitro and that one brand of garlic pill GNC consistently produced statistically similar sized clear zones (19 mm for E. cloacae, 22 mm for K. oxytoca) to that of meropenem (20.5, 26.62 mm) during disc diffusion trials. 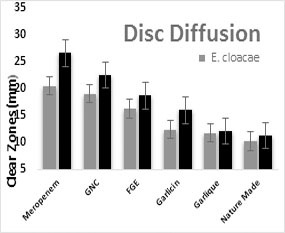 FGE created smaller clear zones (16.3, 18.6 mm) during disc diffusion trials but produced much larger clear zones (46.8, 56.5 mm) in the higher dose well diffusion trials surpassing even meropenem (49.29, 56.25 mm) in the treatment of slower growing K. oxytoca. The efficacy rank of the effective garlic pill brands remained the same throughout the study (from highest efficacy to lowest): (1) GNC, (2) Garlicin, (3) Garlique, and (4) Nature Made. GNC 1000 was utilized for both disc and well diffusion trials. GNC 1100 was added later to the well diffusion trials in order to determine if the more expensive 1100 pills produced equivalent or better clear zones to that of GNC 1000. GNC 1100 clear zones averaged about one mm higher (47.43, 50.90 mm) than that of GNC 1000 (46.82, 49.92 mm). Thus, GNC 1100 was found to exhibit slightly higher efficacy during microbial testing than GNC 1000 and therefore, may be worth the additional cost to the consumer. HPLC results were consistent with the micro results for newly purchased pills. Allicin peaks on the chromatogram were largest for GNC garlic pills; with peaks decreasing for each effective pill. The rank of the pills was identical to the micro results for newer pills. However, expiration and product degradation issues were evident for older pills during HPLC testing, with allicin peak area decreasing over time. Many of the brands degraded well before their listed expiration dates, thus manufacturers should endeavor to revise their shelf life testing SOPs. Five of the nine brands of garlic pills evaluated in this study were found to be completely ineffective against both species of bacteria failing to produce clear zones during microbial testing (Fig. 10 ) or to create an allicin peak during HPLC testing (Fig. 11 ). Whether or not the makers of these garlic pills knowingly produced ineffective pills is unclear; it is possible that some of these companies were using appropriate raw materials but inadvertently deactivated the allicin via erroneous processing methods such as improper freeze drying protocols or by overheating the garlic [19Jansen, H.; Müller, B.; Knobloch, K. Characterization of an alliin lyase preparation from garlic (Allium sativum L). Planta Med., 1989, 55(5), 434-439. [http://dx.doi.org/10.1055/s-2006-962059] [PMID: 17262455] -21Tocmo, R.; Liang, D.; Lin, Y.; Huang, D. Chemical and biochemical mechanisms underlying the cardioprotective roles of dietary organopolysulfides. Front. Nutr., 2015, 2, 1. However, deliberate efforts to mislead consumers by one or more of these manufacturers are also a consideration as herbal remedy producers are not federally regulated and this is a highly competitive multi-million dollar industry. Recently, the NY Attorney General’s office DNA tested herbal products and found that many herbal remedies sold at large retailers such as Wal-Mart and Target did not contain any of the herb listed on the packaging [22Schneiderman, E.T. Schneiderman asks major retailers to halt sales of certain herbal supplements as DNA tests fail to detect plant materials listed on majority of products tested;, 2015. (accessed 2015 September 30). Available from: http://www.ag.ny.gov /press-release/ag-schneiderman-asks-major-retailers-halt-sales-certain-herbal-supplements-dna-tests]. Instead, these pills were found to be full of fillers and contaminants such as: “rice, alfalfa, and even house plants” [22Schneiderman, E.T. Schneiderman asks major retailers to halt sales of certain herbal supplements as DNA tests fail to detect plant materials listed on majority of products tested;, 2015. (accessed 2015 September 30). Available from: http://www.ag.ny.gov /press-release/ag-schneiderman-asks-major-retailers-halt-sales-certain-herbal-supplements-dna-tests]. Our study, similarly found that what was written on the packaging did not necessarily match the product when examining the presence or absence of viable allicin. Many of the garlic pill brands claimed to contain allicin but five of the garlic pill brands were not found to contain viable allicin. Of these five, only one did not make an allicin claim. Confoundedly, half of the effective pills including the most effective brand GNC which should have an allicin claim, failed to make one. Thus, if a consumer were to choose a brand with an allicin claim at the store, that specific brand is more likely not to contain viable allicin than a brand without an allicin claim. GNC brand was found to be the most effective out of nine brands of garlic pills. GNC 1100 were the most effective pills, and their enteric coating may confer viability in vivo. Other studies have shown that allicin is destroyed by digestive juices in the stomach and therefore enteric coatings are required, in order to get the allicin past the stomach to the intestines [23Kannar, D.; Wattanapenpaiboon, N.; Savige, G.S. ; Wahlqvist, M.L. Hypocholesterolemic effect of an enteric-coated garlic supplement. J. Am. Coll. Nutr., 2001, 20(3), 225-231. [http://dx.doi.org/10.1080/07315724.2001.10719036] [PMID: 11444418] ]. Despite this fact, some of the garlic pills on the market are not yet enteric coated. This study was multidisciplinary, thus our research was not just confined to the laboratory. Part of our study surveyed SFASU students and faculty about their views toward herbal remedies, 68% of people stated they would prefer to take two smaller pills rather than one large pill. However, most of the garlic pill manufacturers evaluated in this study, exclusively produced larger pills. Thus, in so doing, they are completely disregarding the preferences of a huge demographic of customers. Moreover, they are failing to benefit from an emerging mega market of non-human customers. Poultry producers have been ordered to phase out antibiotics in production. Thus, an industry savvy garlic pill producer should endeavor to produce tiny, round, effective, sugar and enteric coated garlic pills designed specifically for poultry. Color is important in order to get chickens to eat pills on their own. An earlier color preference study by one of the authors of five flocks of backyard chickens found that they overwhelmingly preferred white, orange, or red bread dots to all other colors (unpublished study by Lucinda Choules). In Conclusion, the fact that GNC garlic pills produced statistically similar clear zones to that of meropenem is highly significant for carbapenem resistant Enterobacteriaceae patients and in vivo trials should be initiated with GNC 1100 garlic pills for CRE patients as few other viable treatments are currently available to them. Garlic produces very few side effects (mostly blood thinning or food allergies). Thus, garlic can be safely trialed even on critically ill patients. Moreover, many studies have noted a synergistic affect between garlic and antibiotics, thus it might be prudent to conduct study trials combining garlic pills with the new CRE antibiotic AVYCAZ (ceftazidime-avibactam) in order to check for a potential synergistic affect [24FDA. FDA approves new antibacterial drug, 2015. Available from: http://www.fda.gov/NewsEvents/Newsroom/PressAnnouncements /ucm435629.htm]. 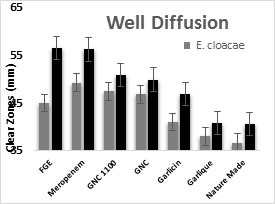 Disc and well diffusion bioassays found commercially prepared garlic pills exhibited significantly different activities against E. cloacae and K. oxytoca in vitro. Of the nine tested garlic pill brands, only four brands showed bioactivities. GNC garlic pills created statistically similar clear zones to Meropenem and FGE. HPLC analysis of active allicin supported bioassay results. Thanks go to Dr. Shiyou Li for his help, guidance, and wonderful ideas for advancing this project. We are grateful to Clay Watts for crafting the DIFF-bolts and for his valuable insight into their formation and W. Dan Bruton, John Moore, Jennifer A. Edwards, Michael J. Martin, Ravaen Slay, Su Zushang, Rebecca Parr, Ron Wiggers, Lynn Clark, Brent Burt and Vohla Minich (all of SFASU) as well as Hardin Rahe, Elizabeth Arnold and Dave and Helen Herron for their support of this project. We thank Govindjee, of the Department of Biochemistry, Department of Plant Biology and Center of Biophysics & Quantitative Biology, University of Illinois at Urbana-Champaign, for reading this manuscript before its publication. Kanj, S.S.; Kanafani, Z.A. Current concepts in antimicrobial therapy against resistant gram-negative organisms: extended-spectrum β-lactamase-producing Enterobacteriaceae, carbapenem-resistant Enterobacteriaceae, and multidrug-resistant Pseudomonas aeruginosa. Mayo Clin. Proc., 2011, 86(3), 250-259. Eisler, P. Deadly bacteria on medical scopes trigger infections. PhD Dissertation; Lawrence F Muscarella: USA Today, 2015. Paauw, A.; Caspers, M.P. ; Schuren, F.H. ; Leverstein-van Hall, M.A. ; Delétoile, A.; Montijn, R.C. ; Verhoef, J.; Fluit, A.C. Genomic diversity within the Enterobacter cloacae complex. PLoS One, 2008, 3(8), e3018-e3018. Kim, S.M. ; Lee, H.W. ; Choi, Y.W. ; Kim, S.H. ; Lee, J.C.; Lee, Y.C. ; Seol, S.Y. ; Cho, D.T. ; Kim, J. Involvement of curli fimbriae in the biofilm formation of Enterobacter cloacae. J. Microbiol., 2012, 50(1), 175-178. Rupp, M.E. ; Fey, P.D. Extended spectrum β-lactamase (ESBL)-producing Enterobacteriaceae: considerations for diagnosis, prevention and drug treatment. Drugs, 2003, 63(4), 353-365. Thenmozhi, S.; Moorthy, K.; Sureshkumar, B.T. ; Suresh, M. Antibiotic resistance mechanism of ESBL producing Enterobacteriaceae in clinical field: a review. Int. J. Pure App. Biosci., 2014, 2(3), 207-226. Liu, H.; Wang, Y.; Wang, G.; Xing, Q.; Shao, L.; Dong, X.; Sai, L.; Liu, Y. The prevalence of Escherichia coli strains with extended spectrum beta-lactamases isolated in China. Front. Microbiol., 2015, 6, 335. Walsh, F. Doripenem: A new carbapenem antibiotic a review of comparative antimicrobial and bactericidal activities. Ther. Clin. Risk Manag., 2007, 3(5), 789-794. Papp-Wallace, K.M. ; Endimiani, A.; Taracila, M.A. ; Bonomo, R.A. Carbapenems: past, present, and future. Antimicrob. Agents Chemother., 2011, 55(11), 4943-4960. Salami, H.A. ; John, A.I. ; Ekanem, A.U. The effect of aqueous preparation of Allium cepa (onion) and Allium sativa (garlic) on erythrocyte osmotic fragility in Wistar rats: in vivo and in vitro studies. Niger. J. Physiol. Sci., 2012, 27(1), 29-34. Harris, J.C.; Cottrell, S.L. ; Plummer, S.; Lloyd, D. Antimicrobial properties of Allium sativum (garlic). Appl. Microbiol. Biotechnol., 2001, 57(3), 282-286. Ross, Z.M. ; O’Gara, E.A. ; Hill, D.J. ; Sleightholme, H.V. ; Maslin, D.J. Antimicrobial properties of garlic oil against human enteric bacteria: evaluation of methodologies and comparisons with garlic oil sulfides and garlic powder. Appl. Environ. Microbiol., 2001, 67(1), 475-480. Bauer, A.W. ; Kirby, W.M. ; Sherris, J.C.; Turck, M. Antibiotic susceptibility testing by a standardized single disk method. Am. J. Clin. Pathol., 1966, 45(4), 493-496. Magaldi, S.; Mata-Essayag, S.; Hartung de Capriles, C.; Perez, C.; Colella, M.T. ; Olaizola, C.; Ontiveros, Y. Well diffusion for antifungal susceptibility testing. Int. J. Infect. Dis., 2004, 8(1), 39-45. Fujisawa, H.; Suma, K.; Origuchi, K.; Kumagai, H.; Seki, T.; Ariga, T. Biological and chemical stability of garlic-derived allicin. J. Agric. Food Chem., 2008, 56(11), 4229-4235. Jansen, H.; Müller, B.; Knobloch, K. Characterization of an alliin lyase preparation from garlic (Allium sativum L). Planta Med., 1989, 55(5), 434-439. Cavagnaro, P.F. ; Camargo, A.; Galmarini, C.R. ; Simon, P.W. Effect of cooking on garlic (Allium sativum L.) antiplatelet activity and thiosulfinates content. J. Agric. Food Chem., 2007, 55(4), 1280-1288. Tocmo, R.; Liang, D.; Lin, Y.; Huang, D. Chemical and biochemical mechanisms underlying the cardioprotective roles of dietary organopolysulfides. Front. Nutr., 2015, 2, 1. Kannar, D.; Wattanapenpaiboon, N.; Savige, G.S. ; Wahlqvist, M.L. Hypocholesterolemic effect of an enteric-coated garlic supplement. J. Am. Coll. Nutr., 2001, 20(3), 225-231.